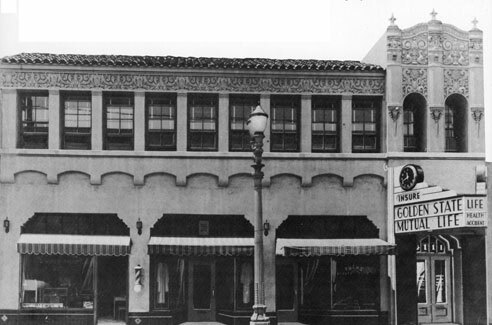 Golden State Mutual Life Insurance Company, the largest black-owned insurance company in the west, was founded by William Nickerson, Jr., Norman Oliver Houston and George Allen Beavers, Jr. On July 23, 1925 they opened as the Golden State Guarantee Fund Insurance Company in a one-room office at 1435 Central Avenue, Los Angeles, with few amenities and $17,800 in capital. Within three months the company had outgrown its office and moved to a storeroom at 3512 Central Avenue. By the end of its first year the company had established an office in Oakland, California, had sold more than $260,000 in policies, and had $6,000 in reserves and a surplus of over $16,000. Within three years Golden State Insurance had over 100 employees including sixty agents as well as branches in Pasadena, Bakersfield, San Diego and Fresno. In 1928, using all African American design and labor, they built a two story building at 4261 Central Avenue where the firm occupied the top floor while the main floor was rented to black merchants. Intelligent business decisions helped them weather the Depression, remaining profitable throughout and even paying out dividends beginning in 1930 and continuing, uninterrupted, to this day. The name was changed to Golden State Mutual Life Insurance Company in 1931, and by the end of the 1930s, assets had grown to $437,000 with $6 million in policies. In 1938 they set up operations in Illinois and in 1944 they opened a branch in Texas. By the end of World War II assets stood at $2 million, surplus funds at $750,000 with nearly $24 million in policies. At this writing the company has offices in fourteen states with over $4 billion dollars in policies. It is the third largest black-owned insurance company in the nation and its Los Angeles office has an extensive collection of art by African American artists. John N. Ingham and Lynne B. Feldman, African-American Business Leaders: A Biographical Dictionary (Westport: Greenwood Press, 1993).